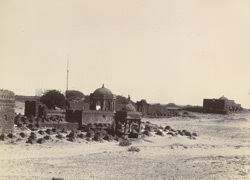 Photograph of Mangroli Shah’s Tomb at Somnath in Gujarat, taken by the travelling commercial photographer F. Nelson during the 1890s. The album is inscribed: “With best compliments from H.H. Rasulkhanji, Nawab of Junagadh (India)” and was formerly in the collection of Sir William Lee-Warner (1846-1912), who served in the Indian Civil Service and was a Member of the Council of India between 1902 and 1912. Somnath is situated on the west coast of Saurashtra overlooking the Arabian Sea 6 km (four miles) east of Veraval. Also known as Prabhas Patan, it is a centre of Hindu pilgrimage. There are various ruined monuments and shrines in the surrounding area. Beginning with Mahmud of Ghazni in 1024, Somnath was taken by successive Muslim invaders. Another image of the tomb is captioned as a dargah, the shrine or tomb of a notable Muslim saint.